With the sun in Cancer (creativity and feeling) and the sun in Sagittarius (intuition and optimism), Thursday and Friday are Page of Wands days. The Page of Wands represents inspired inspiration in its most fragile form. There’s a stirring of possibilities that we know may, in the end, not work out at all. This often manifests as restlessness at work or a vague feeling of dissatisfaction that’s not yet strong enough to motivate change. This initial influx of new ideas and fantasies are innocent enough. But the big question is what to do with them? 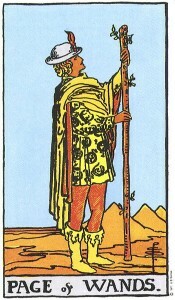 The key to making the most of a Page of Wands day is to sit back and be what I like to call ‘a student of life’. Ask yourself questions like how much your present circumstance reflect the real you? Does your job or relationships give ample opportunity to explore and express those things you hold most dear? Are you living your life as you want it to be or are you living a pre-programmed script (either societal or parental)? You may find yourself not completely satisfied with the answers to these questions. Yet be rest assured that this is not yet the time to act. Instead, take stock of the intuitions you have on a Page of Wands day, jot them down in a notebook or your diary, and nurture them over the coming months or even years. For rather than being guidelines of how to structure your ‘now’, they are harbingers of things yet to come.